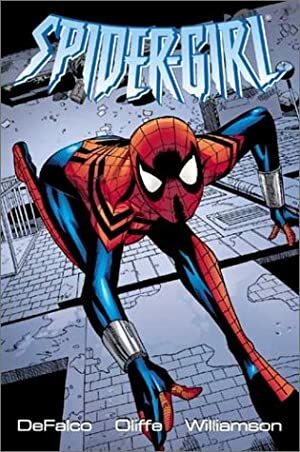 The Dragon King is an enemy of Spider-Girl (May Parker). He exists in a possible future of the Marvel Universe, called MC2. 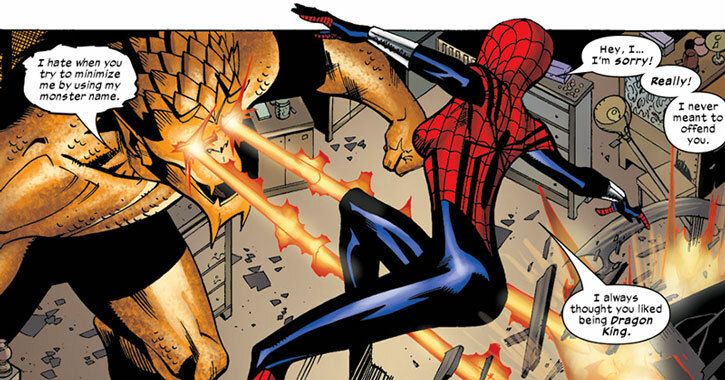 If you’re not familiar with the MC2 continuity, you should read our Spider-Girl profile first. Real Name: Carlton T. Hackmutter. Group Affiliation: One-time member of the Savage Six. Height: 5’7” Weight: 175 lbs. In his superhuman form, Mr. Hackmutter is a bulldozer-sized, winged draconic creature who can shoot laser-like beams from his eyes. 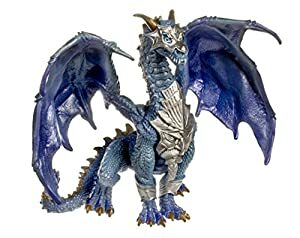 His draconic strength seems to be roughly in the high end of the “Class 50” range, with matching durability. Despite weighing tonnes he can somehow fly. Though this all seems quite formidable, the Dragon King isn’t actually much of a threat for superhuman foes. His speed and accuracy are at best mediocre, he doesn’t have combat experience, he’s not particularly intelligent or focused, and his pain tolerance is Poor (4). Thus, while his rampages can do a lot of damage, people who can find means to hurt him will soon put a halt to them. He is noticeably better at hitting people with his tail than with his hands or eyebeams. But such blows are far more survivable – in DC Heroes terms it’s a textbook Flailing Attack, and in DCA it’s trading effect for attack. For decades, Carlton Hackmutter worked as a janitor at the Midtown High School in New York City. By the time of the MC2 continuity, he was old enough to earn his pension. However, he continued to work. He needed money for his life’s passion – a large collection of draconic sculptures from all over the world. He kept these in the janitorial room in the basement of Midtown High. Presumably, his apartment was too small. One day, Hackmutter badly cut his hand while picking up broken glass. 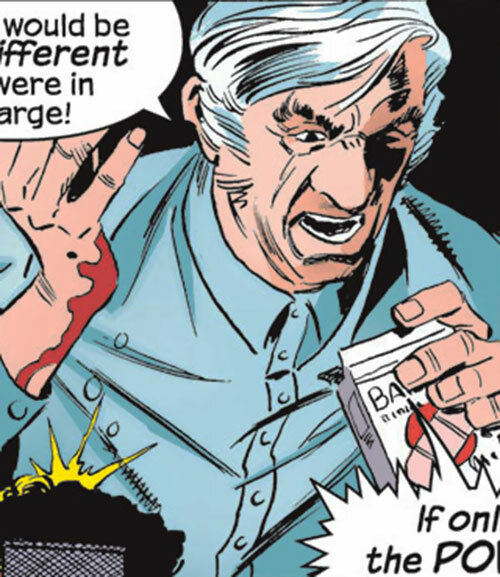 Cursing about the irresponsible students, he went to the janitorial room for bandages, and accidentally spilled blood on an item in his collection. This piece was an ancient Chinese medallion depicting a dragon. Responding to the blood and Hackmutter’s rants about wanting to be in charge and have power, the magical pendant transmogrified him. The Dragon King’s rampage lasted for but minutes, as a Midtown High student intervened. Spider-Girl (May “Mayday” Parker) tricked Hackmutter back to the janitorial room, then into punching through an electrical main. Knocked unconscious, he was arrested and kept sedated. No one was apparently killed or seriously wounded, as Hackmutter was more interested in ranting and breaking things than in killing people. But Spider-Girl likely prevented accidental fatalities. About two years later, the Dragon King was recruited by Funny Face to join his Savage Six. 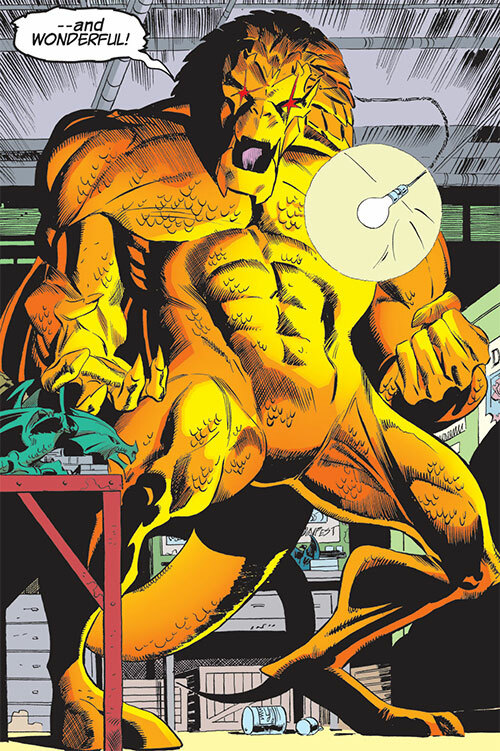 Though the team’s stated goal was revenge against Spider-Girl, Hackmutter was in simply because he needed money. Funny Face set up a gauntlet for Spider-Girl to run, with the Dragon King being the third opponent she would meet. May quickly defeated the man-monster, though the gauntlet was starting to wear her down. 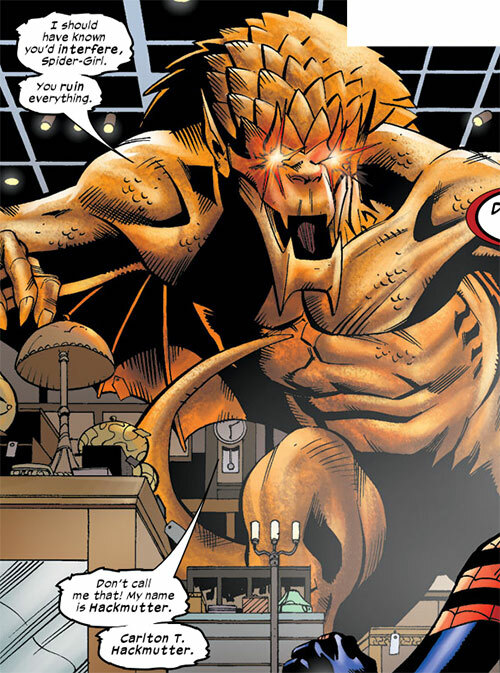 By this point, Hackmutter was tired of being a monster and being called the Dragon King. His power trip was over, and he wanted to go back to his old life. But he needed the medallion to return to his human form. A lonely, unpopular student named Kevin Hartman helped him hide in the Midtown High janitorial room, and had the Dragon King beat up bullying students. However, May Parker intervened and realised that Hartman was abusing Hackmutter’s friendship. She tore Hackman’s shirt open, revealing that the student had been hiding the medallion so Hackmutter would remain the Dragon King. The former janitor could resume his human form at last, and both he and Hartman were arrested. The Dragon King looks like a cross between Stegron and the Dragon Man. Hackmutter is terminally bitter and hates everyone. He didn’t even acknowledge that some students *weren’t* disrespecting him. As an aged nerd he grew up on Conan and John Carter novels or the original Star Trek TV show. But his dreams of being a great pulpy hero were ground down by his menial occupation and poverty. His only pride was his dragons collection, and he was a curmudgeon about everything else. 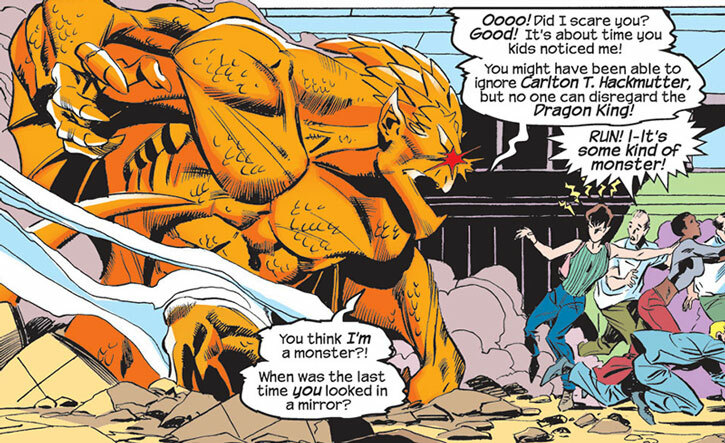 Though he originally got a huge kick out of being the Dragon King, the power trip got old after some months. By then, his old life started looking pretty good compared to being a huge monster. He felt miserable, and prone to helping other underdogs as he fruitlessly looked for his medallion. Super-ventriloquism only to increase the range at which he can be heard. Alter-Ego (No Powers and all Attributes at 02, but requires the medallion to change), Familiarity (Dragon sculptures through the world, Janitorial work). Age (Old), MIA toward Collecting dragon-themed sculptures, Public Identity, Strange Appearance. – Real big — Permanent Growth 5, Enhanced Dodge 2, Enhanced Parry 2, Improved Grab. – Draconic strength — Enhanced Strength 8 (Quirk – doesn’t enhance Athletics), Enhanced Fighting 4. – Draconic durability — Protection 4 (Limited 1 to Physical Impact), Enhanced Stamina 3. – Draconic wings — Winged Flight 4. – Draconic voice — Feature 1 (voice enhanced as if using a makeshift megaphone). – Eyebeams — Ranged heat damage 8, Ranged combat (Eyebeams) 2. Expertise (Janitor) 4 (+4), Expertise (Dragon-themed collectibles) 4 (+4), Expertise (Old sci-fi) 2 (+2), Intimidation 2 (+2), Perception 1 (+1), Ranged combat (Eyebeams) 1 (+3). Gone, gone the form of man… Dragon King needs his magical medallion to transmogrify back and forth. Low status In his human form Hackmutter is an old curmudgeon with a low income and next to no social status. Strange appearance The Dragon King’s form is huge and threatening. Obsession His collection of draconic statues is what he prizes most in the world, and he might be interested in expanding it. Trade-off areas Attack/Effect PL 9, Dodge/Toughness PL 6, Parry/Toughness PL 7, Fort/Will PL 5. Point total 78. Abilities 0, Defences 4, Skills 6, Powers 68, Devices 0, Advantages 0. Equiv. PL 6. The Enhanced Parry and Enhanced Dodge part of the “Real big” power is simply to compensate for the Growth penalties, as it makes overall notation clearer. His Toughness has been counted as 10 for trade-off calculations. Writeup completed on the 2nd of May, 2014.